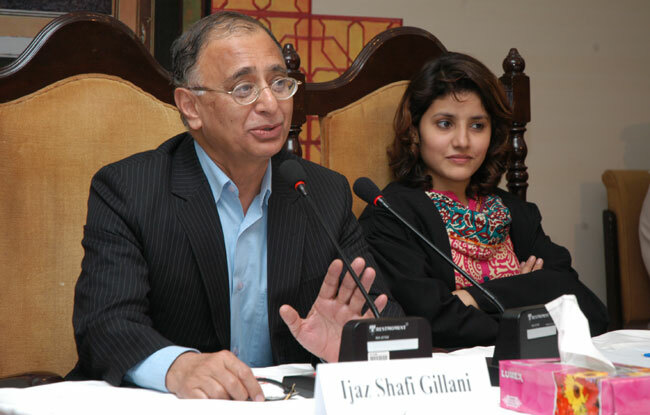 Islamabad, September 23: While addressing the Youth Parliament Pakistan on the last day of the fifth and final session, Dr. Ijaz Shafi Gilani was of the view that social stratification is one of the major problems of Pakistan which need to be addressed at the earliest. In his view, 180 million Pakistanis are restless because of stagnant governance and mobilization of population. Dr. Ijaz Shafi Gilani was of the opinion that President Musharaf used graduation condition for contesting election to disenfranchise a major chunk of population, as education is not the only criteria for political maturity. Earlier, during the proceedings of the House Mr. Aamir Abbas Turi (YP08-FATA01) called the attention of the Honourable Youth Prime Minister to the unfortunate incident of a bomb blast earlier this month in which 20 innocent people from Turi Tribe were martyred. Mr. Salman Khan Shinwari (YP18-KPK05) presented a couple of reports prepared by the standing committee on law, parliamentary affairs and human rights on low voter turnout and judicial reforms in Pakistan. Ms. Anum Mohsin (YP22-PUNJAB02) presented a bill “Qabailistan Bill” further to amend the constitution of Islamic Republic of Pakistan. Mr. Muhammad Sohail (YP34-PUNJAB14), member standing committee on IT and Telecommunication, tabled a resolution highlighting the importance of pre-paid mobile connections and not to impose any ban on its use unilaterally. However the committee recommended regulating the SIM issuance procedure to curb its immoral and criminal use. The last and final sitting of the 2012 batch of Youth Parliament was followed by elections to the Youth Parliament Pakistan Alumni Association 2012. Mr. Touseef Ahmed Abbasi (YP02-AJK02) has been elected as the President of the YPP Alumni Association 2012, while Mr. Saleem Khan (YP07-BALOCHISTAN05) has been elected as the Vice President Balochistan and AJK; Mr. Hafeez Ullah Wazir (YP09-FATA02) elected as the Vice President Khyber Pakhtunkhwa, ICT & FATA; Ms. Rabiya Shamim (YP53-SINDH05) Vice President Sindh; and Mr. Atiq ur Rehman (YP24-PUNJAB04) has been elected as the Vice President Punjab. The office of the General Secretary YPPAA 2012 has been filled by Mr. Gulfam Mustafa (YP26-PUNJAB06) while Mr. Kashif Yousaf Badar (YP27-PUNJAB07) has been elected as the Finance Secretary. Today marked the completion of the final session of the fourth batch of Youth Parliament Pakistan, a project conceived, planned and implemented by PILDAT since 2007. The first-ever batch of Youth Parliament Pakistan completed its first term successfully in 2007-2008 while the second batch completed its term in 2008-2009. The third batch of Youth Parliament Pakistan, 2009-2010 and now the fourth batch of Youth Parliament Pakistan 2012. The Youth Parliament Pakistan (www.youthparliament.pk) has been serving as a platform for Pakistani Youth aged between 18-29 years. It is patterned after the National Assembly of Pakistan. Establishment and facilitation of the Youth Parliament is part of PILDAT's focus on Youth in the country and Youth's awareness education and training in the norms of politics and democracy in the country. PILDAT strongly feels that sustainable democracy and the sustainability of sound democratic institutions in Pakistan is not possible without youth's involvement in the democratic and political process even if this involvement is simply as a citizen or voter.